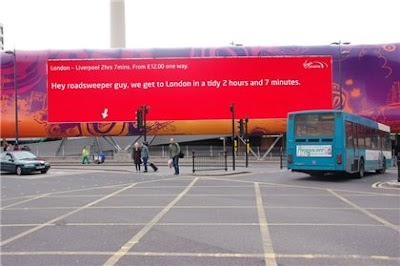 A trio of leading digital out-of-home users will aim for the accolade to be called '2010's most iconic digital poster' in an X-Factor style competition at the Media Week DOOH Media Summit on 6 May. Digital posters by Nokia, McDonald's and Virgin Trains (which we highlighted early last year) will be showcased in front a judging panel that includes senior marketers from Procter & Gamble and Virgin Media. The contestants will have to prove their poster's creative, technological and logistical excellence, and then await the judges' vote, combined with that of the audience, to know the winner. I haven't seen the other two, but the Virgin entry was superb and gets my vote.